Kershaw 1660ST assisted opening Leek with partially serrated blade. 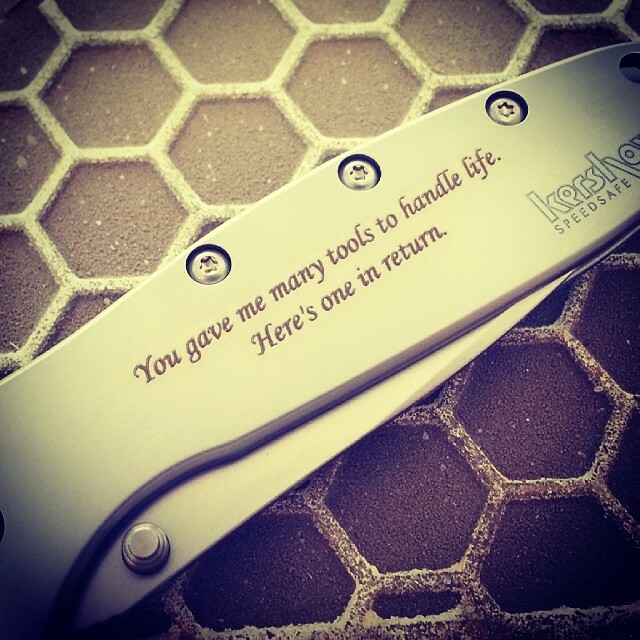 The Kershaw Leek has been around as long as we can remember. 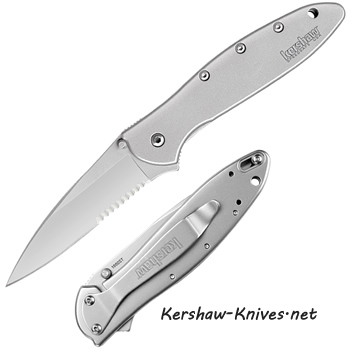 Ever since our store opened for business back in 2004 the Kershaw 1660ST has been a core stock item. In fact hardly a day goes by that we do not sell at least one. There are several ways to open this knife. One way is is to use the flipper located on the spine. The other way is to use the thumbstud. It does not matter if you are left handed or right handed because they thumbstud goes all the way through. The pocket click can be changed around so that you can carry it in a tip-up or tip-down configuation. Another great feature of this knife is that is looks absolutely beautiful when it is engraved! 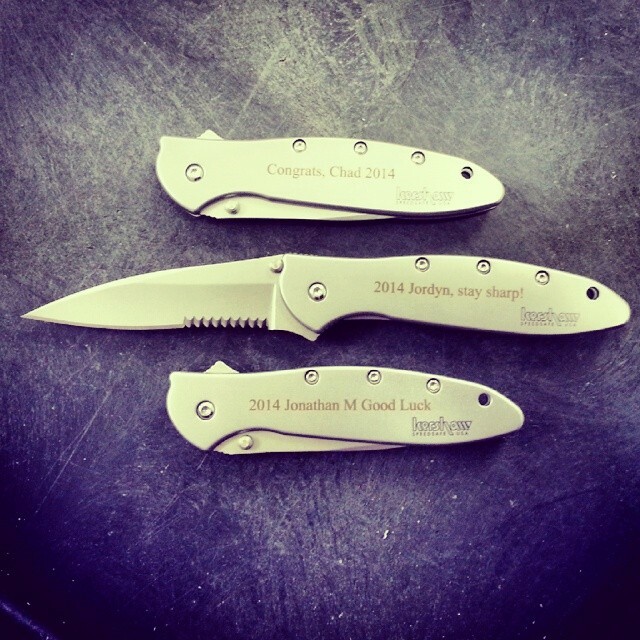 There are lots of pictures in our blog that show pretty much anything from grooms getting their groomsmen names engraved and companies getting their logos engraved. This is our Kershaw 1660st. This is the Ken Onion Leek, very well-known, very popular model. This is the serrated, you got the thumb stud here where you just push and out it deploys. Gonna have half serrated and then of course you have the nice fine edge very sharp point. All stainless steel. The nice pocket clip on the back can be adjusted for either for a left or a right carry. 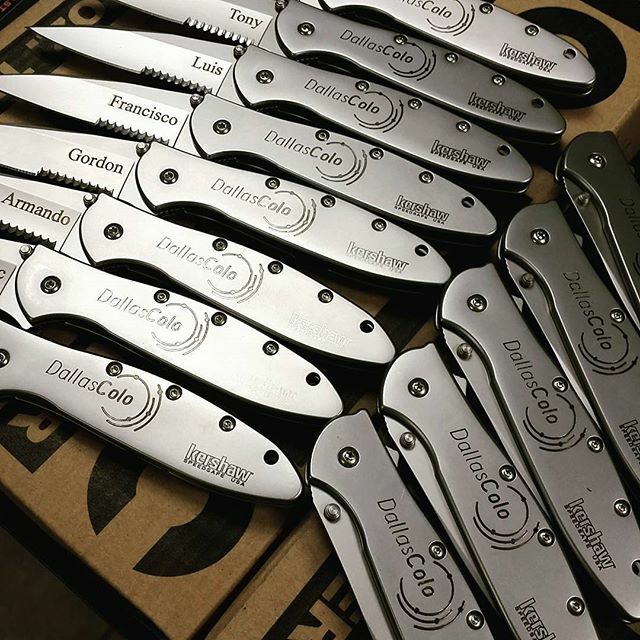 (It) has the liner lock where you just push down, close the knife and has the great locking button you just push up that way. This will not open up when you are not ready for it. 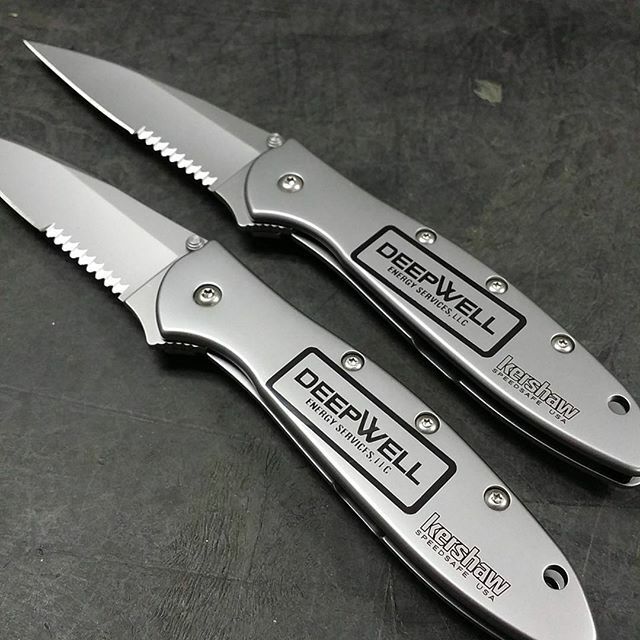 The Kershaw Leek when closed is four inches. The blade length is three inches. The blade is made with the Sandvik 14C28N stainless steel. (The) handle is a 410 stainless steel and this is still made in the USA so for all of our USA lovers, this is still an American-made knife which makes this one of our very most popular knives, the Kershaw 1660ST.